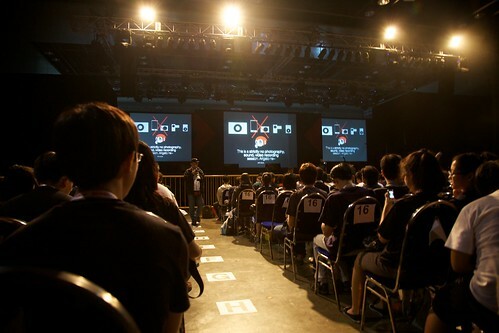 AFAX’s Concert on day 2 was a blast! Although there is improvement needed for some areas of the concert, it didn’t fail to raise the fun factor to another level. Bring more light sticks people! The concert felt like 3 mini-concerts in one. Good or bad, it was the interval time in between them that raised some concerns. 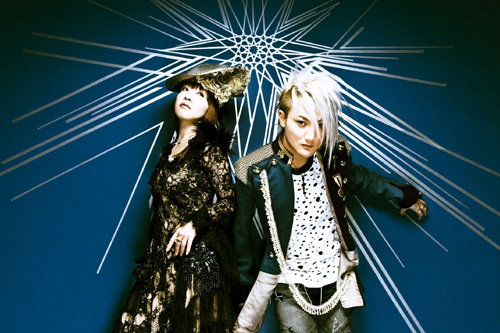 The starting act was Angela, a duo group consisting of vocals Astuko and guitarist KATSU. This group’s first breakthrough was the opening song “Asu e no brilliant road” for Stellvia of the Universe. Since then, they have provided songs for various anime like Soukyuu no Fafner, Heroic Age, Shikabane Hime and Asura Cryin’. For their opening in the I love Anisong Concert, most of their songs were from the opening or closing songs of Soukyuu no Fafner (an anime series which I chose to skip). KATSU taught us a very simple otaku greeting between comrades. The energy level had started to rise up, building up exponentially! Atsuko sang her heart out while KATSU played some wicked strings on the guitar, running around occasionally. After Angela left the stage, the lights were turned off. The irritating “No recording of any forms, video, sound or photos” were left up there for another eternity. The stage crew begin making preparations for the next performance involving lots of speakers, mics and a drum set. I could definitely guess who’s out next. But, there was a pretty long wait of about 15 mintues. At this point people were sitting down after all that hand pumping into the air. I can sense the energy level of the concert dropping lower every second. Tsk, how can they allow this to happen? People were getting restless, over-zealous fans tried once again to take over the middle aisle to get closer to their stars. Only thing standing people them was the fence and the big buy with the torchlight flashing in their faces, pushing them back. There were staff hiding among the seats patrolling the aisle, flashing light into the folks who doesn’t have the basic Japanese concert etiquette. They throw people who break the rule out of the concert over there. Immediately. The only reason I bought today’s tickets were for the most powerful Japanese girlie pop rock girl band SCANDAL! 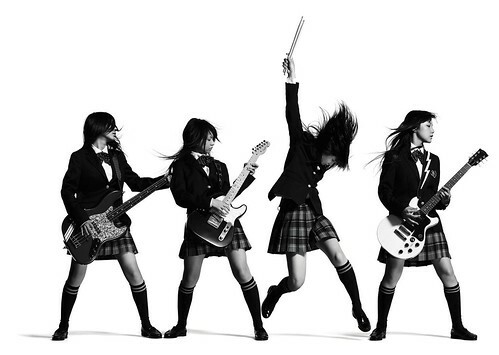 They are from Osaka, consisting of Haruna Ono as vocal/guitar, Rina Suzuki as vocal/drummer, Mami Sasazaki as vocal/bass and Tomomi Ogawa as vocal/guitar; these 4 head rocking, energetic girls rocked the hall with their tunes and charms. They started writing their own songs while schooling. They performed on the streets at Shiroten in Osaka Castle Park on weekends, clubs and music halls till they got signed up by a record label company. They caught my attention with their single “shojou S”, one of Bleach’s opening songs and “Shukan Sentimental” for the ending theme of Fullmetal Alchemist: Brotherhood. 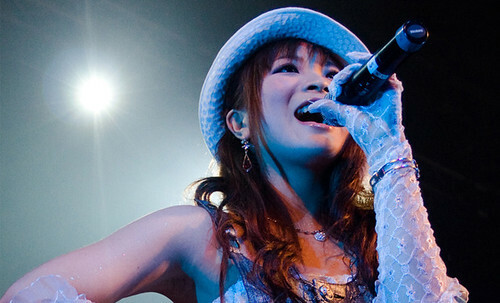 Haruna was lead singer, a big sister figure for the group as she is the oldest of them all. She got the act together to pump up the crowd and go wild. Tomomi is one crazy guitar rocker. She runs all over the stage plucking the strings with so much feeling and action. This wowed her fans lots. Mami was the quieter one of the 4, occasionally like Tomomi, she runs to the other side of of the stage getting some wicked tunes out of her guitar. Rina who is the most kawaii of the girls has the sweetest smile while drumming. It’s a rare sight for someone who is bashing on the drums. Awesome + fantastically attractive. Her pose of raising up the drumstick on one hand in the air is really mesmerizing. Go SCANDAL! An absolutely fantastic concert!! Worth every cent paid for! Really do hope/pray that they will be back next year. The stage is lighted up again. People started moving things back to the backstage. Looks like no encore by SCANDAL. The last performance remains, May’n! She’s a returning performer for the 3rd year at AFA. For my first Japanese concert in my life, she was the main draw. May Nakabayashi is her full name, the singing voice of Sheyl Nome in Marcross Frontier. She rocked the halls for the past 2 years. She will do it again! She’s working on a documentary movie on her career and how music without borders can reach out to people around the world. Hope their music has reached out to you, so GO BUY their CDS now!